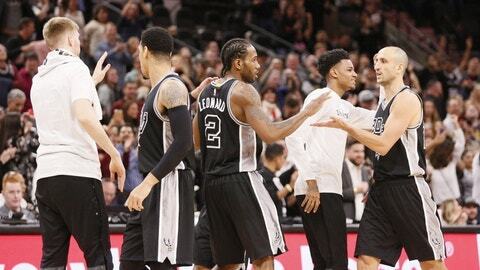 San Antonio Spurs have a winning culture, there is no doubt in that. One of the main characteristics of teams with winning culture is a strong response to losses. Fortunately, Spurs have only eight of those so far, and even better are Spurs displays after them. “It’s just basketball.” It’s something that Gregg Popovich will often say. Whether you win or lose, you move on. Keep doing what you do and try to do it the best you can. However, this kind of attitude doesn’t exclude competitiveness. In fact, Spurs don’t like to lose. Really. They react to losses very strongly, coming into next game with extra amount of effort and focus. First of all, only twice this season have the Spurs lost two games in a row (Clippers/Rockets, and Pelicans/Mavericks). This could be a positive sign heading to the playoffs, keeping composure after losses and responding quickly and strong. In addition to this fast recovery, Spurs game quality in games following losses have been very good. Not only better than lost games, it’s obvious that the drive is on another level. Spurs numbers in those games are better than all others, including games Spurs won, but not after losses. So let’s take a quick look at statistics that back up this statement. Spurs defense is improving as season goes. Spurs are now NBA’s most efficient defensive team. Prior to recent injury issues and consequent changes in roster and starting lineup, Spurs defensive rating was even better. With a renewed focus on defense, the Spurs generate more defensive rebounds (36) and total rebounds (44.36) after a loss. In all other games they average 33.1 defensive and 42.67 total rebounds. The Spurs however have less offensive rebounds in those games. This is an indicator that Spurs clearly want to keep defensive composure, with focus on transition defense, leaving offensive board. Getting back in time for good defensive position is priority. Blocked shots are also more frequent for Spurs after lost game. They average 6.54 block in those games, with 5.56 in other games (5.27 in losses). Also, number of steals is greater (8.45 comparing to 7.78). The Spurs offense is at higher level after losses, too, with 109.45 points per game. That’s better comparing to other games (106.86), while in losses Spurs score only 98.64 points in average. As for shooting percentages, the Spurs significantly rise their 3-point percentage after lost games. They shoot unreal 44.87% from beyond the arc in those games. That’s far more better that in rest of games where Spurs are at 39.84% (35.5% in losses). Considering Spurs are number one team at 3-point efficiency, this is even more amazing. Overall field goal percentage is also at higher rate after losses (48.62%), comparing to rest of games (47.55%). Spurs shoot 42.79% from the field in games they lost. Spurs ball movement is on its way up for a while. However, they have highest assist ratio when responding to loss (24.45 per game), comparing to other games (23.97). This improvement also comes with greater care of the basketball. Spurs commit only 11.27 turnovers in average in games after loss, while in rest of the games this number jumps to 12.82. Important thing to mention are injuries the Spurs are struggling with lately. Parker, Leonard and Aldridge missed some games, and Gasol will be out for a while. This could be on of the main reasons for Spurs less efficient performances in past few games. Prior to Pau injury, Spurs stats was even better. So number one priority for Spurs heading to last third of regular season is – be healthy. In comparison to Spurs main contenders in West, Warriors and Rockets, Spurs projected starting lineup had the least games together. Parker, Green, Leonard, Aldridge and Gasol played only 23 games together so far. Even with all these difficulties It’s really amazing that ALL statistical parameters improve in games that Spurs play after loss. This is a clear indicator that this team has great character. And it’s something that Spurs will need when it matters the most – in Playoffs.